The Kona Crime Prevention Committee recognized Officer Ellsworth Fontes as “Officer of the Year” in a luncheon ceremony Wednesday (September 9) at King Kamehameha’s Kona Beach Hotel. Fontes was honored for his outstanding performance as a Community Policing officer. Sergeant Floyd Richards, who oversees Community Policing in West Hawaiʻi, said he has received nothing but praise from the community about Fontes. 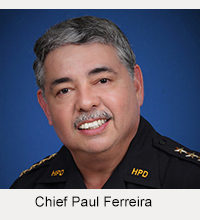 “Just recently I received a letter of appreciation from Pualani Estates residents recognizing him as an outstanding individual and being a wonderful asset to their board and community,” Richards wrote earlier this year when nominating Fontes as “Officer of the Month” for April. 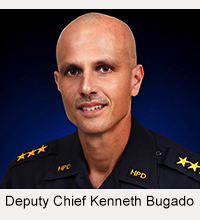 Richards said Fontes clearly understands the purpose, objectives, practices and procedures of Community Policing. In addition to Fontes’ Community Policing duties, Richards noted, his caseload also included numerous arrests, citations, court documents, criminal cases and miscellaneous complaints.